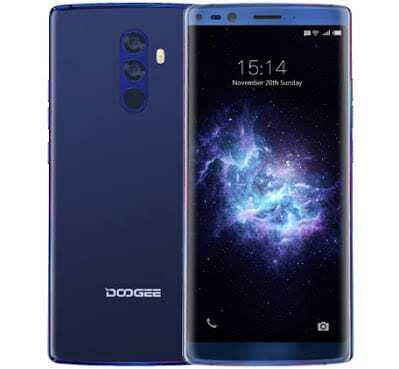 Does anyone remember the Doogee Mix smartphone that was released by the Chinese smartphone company, Doogee? The device had a beautiful design appearance and overall aesthetics. Asides the lovely outside qualities, the device also comes with spectacular internal software features like the huge 4 GB of RAM, the Android Nougat OS, 64 GB of built-in memory, and a Helio P25 processor. However, the Doogee Mix 2 is a bigger and better version of the Doogee Mix and now we will take a look at how much better things got on the Mix 2. First off, the design and appearance. The Doogee Mix was launched with a much broader and wider width. However, on the Doogee Mix 2, a “longer” device what Doogee opted for. Expect the comparison of the two devices soon enough. All the entire processes and running of the Doogee Mix 2 are carried out by the MediaTek Helio P25 Octa-core processor which runs at a speed of 2.5 GHz. This is an impressive feature on the device if you ask me. It’s not everyday or every time you get to see a smartphone with no “premium” tag or status running on a processor as fast as 2.5 GHz. The storage capacity of the Doogee Mix 2 is wowing! The device comes with 6 GB of RAM (compared to the 4 GB of the Doogee Mix) and 128 GB of built-in memory. Surprisingly, despite this massiveness of the storage, the device comes with Micro SD card support. All you need to do is [eafl id=”24796″ name=”Jumia NG Memory Cards” text=”purchase a Micro SD card”] and insert in the SIM 2 slot (Hybrid SIM). That’s not all. Just like majority of devices, the Doogee Mix 2 runs on the Android v7.0 Nougat and comes with a Face ID feature for special facial recognition unlock. Could this be an iPhone X alternative? Now, I’ve got to ask. What first crosses your mind when you see a device with four cameras? (I want to hear your mind speak in the comments). Well, what comes to my mind is “Wow”. The Doogee Mix 2 comes with a 16 MP and a 13 MP lens combination on the rear and a LED flash support. Up front, two 8 MP + 8 MP cameras together with her front flash provides you with the best of selfies. A non-removable Lithium Polymer battery with a capacity of 4,060 mAh keeps the device up and running. With the inherent Quick charge feature, you don’t have to worry about battery lag or slow time charge.